This puppy was bred by Judith Blunt-Lytton, 16th Baroness Wentworth (“Lady Wentworth”), and its image appears in Lady Wentworth’s Toy Dogs and Their Ancestors (1911). Lady Wentworth was a dog breeder and exhibitor who was often quite critical of the institutionalized fancy and what dog shows had become. Although she bred brachycephalic English toy spaniels (what we Americans call them), she was somewhat worried where this might lead. She was fully aware that there was always a chance of producing a puppy with so little muzzle that it would be a monstrosity as a result of the selection pressures to produce the shortest muzzle in the show dogs. Short muzzled dog have issues cooling themselves and breathing, and I think a dog with a muzzle this short would have a hard time feeding itself. The more noseless a Spaniel is, the more delicate his lines should be. The curves must be extraordinarily subtle so as not to offend the eye. Remember, there are only two canons of proportion possible in a noseless type; one is that of the Bulldog, and the other that to which the Japanese type is the nearest approach. Anything which deviates from the laws of proportion belonging to these two types is a mathematical abomination. In one the curves are all strong and rugged (pg. 144-145). Not many people would do something like this. I feel very sorry for this little Ruby. Rubies remind me of Elmo. Ironically, this breed is healthier on average than the Cavalier King Charles spaniel that was bred to be a more healthily conformed version of the toy spaniel. In the modern era, I haven’t seen anyone famous with an English toy spaniel. Reagan had a cavalier, and worldwide, cavaliers are pretty popular. But no one gives the little toy spaniel any love. 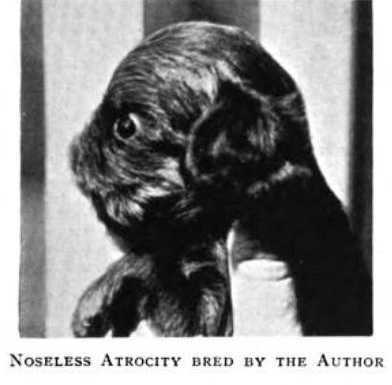 This image comes from Toy Dogs and Their Ancestors (1911 edition) by Lady Wentworth. The expressions on the faces of the two chin is priceless! 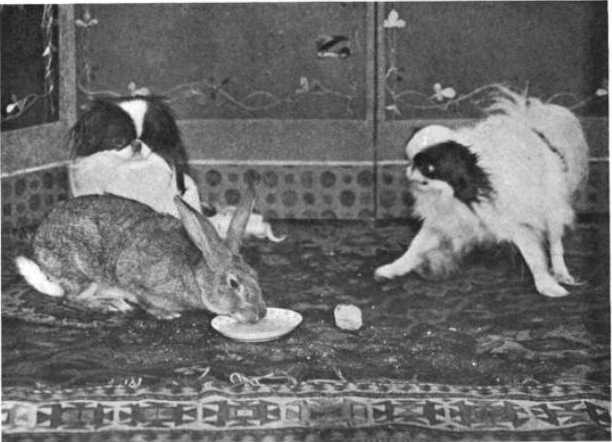 Japanese chin, which were then called “Japanese spaniels,” really haven’t changed much in the past century. An modern English toy spaniel of the "distorted noseless type." The whole fabric of modern judging is utterly unsound. The Club judges are, moreover, bound by the Club regulations, which prevent the exercise of any private judgment. When I say that I consider the modern standard incorrect, I do not mean that we should go back to long noses. I frankly own that before I began my historical investigations I held the same opinion as that of other writers, namely that the ancestors of the Toy Spaniel had long noses, and I was prepared to advocate a return to whatever the original type might have been. My researches have, however, led me to an exactly opposite conclusion. The red-and-white Toy Spaniel has a perfect right to his short nose. The King Charles had comparatively long-nosed ancestors, but is now a composite breed made up to suit modern taste and no longer bears any resemblance to his earlier progenitors. I still maintain that certain types of modern dogs are monstrosities, and shall to the end of my days fight against these types and protest against their propagation. I have been working for some years on the system of drawing attention to the distorted noseless type. There are several noseless types but of late breeders have gone in for sensationalism in heads regardless of beauty or even of general soundness. I have purposely ridiculed these extraordinary deformities, hoping that at last people would see the grotesqueness for themselves, and this, I am happy to say, has already resulted in the Toy Spaniel Club taking steps to revise their points. It is, however, impossible for any club to properly revise its points without a complete knowledge of the history of its breed, and this no one has in the case of Toy Spaniels, because no one has ever had access to the proper material (p. 88). One must understand that toy spaniels from the British Isles were originally several different breeds. Lytton is writing here about the composite breed that developed from these unique strains. In the AKC ring, these dogs are shown in four color varieties, which partly reflect the original strains that once existed as much more distinct strains in the breed. One should read Lytton’s text. She points out that many different strains of English toy spaniel were being crossbred with toy bulldogs to create the “noseless” type. At the time, this type of dog became the sensation in English toy spaniels, and it seems that virtually no one listened to Lytton, because the modern English toy spaniel breed is quite brachycephalic— without exception. The brachycephalic takeover of the breed drove an American fancier, Roswell Eldridge, to care set up a prize for anyone who had a dog that looked like the old Blenheim spaniels that looked like the dogs that were kept in Charles II’s day. From that movement, the Cavalier King Charles spaniel was developed. 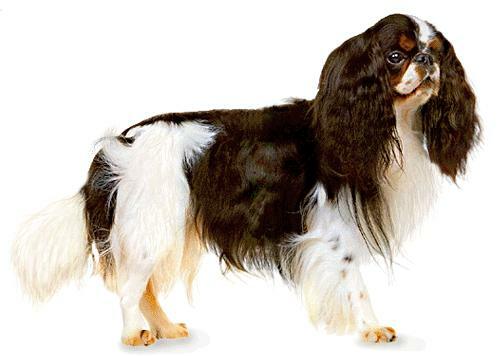 I think they would have been better off if they had used papillons or phalenes to create a long-muzzled toy spaniel strain, instead of searching for rare atavisms in the brachycephalic English toy spaniels. Trying to breed from atavisms is always a bit of a tricky thing. Atavisms are called atavisms because they are rare and may not have enough numbers to create a sustainable population. In this respect, Cavaliers were probably already doomed to have lots of health problems, simply because of the small number of founding dogs in the breed. Of course, neither breed is all that healthy, but if one reads Lady Wenworth’s critique of her breed and Max von Stephaniz’s critique of the development his breed (in the comments), one notes a common element of discord. Sensationalism and fads were already leading to ruination. Even with the existence of well-constructed breed standards in the more modern era, we still see these elements controlling the destiny of so many breeds. These writers are saying something more along the lines of William F. Buckley’s line about standing athwart history and yelling “Stop!” They are being reactionary in a sense to the degradation of their beloved breeds, which we now know, got far worse as time marched on. But the fights over purebred dogs are not new. We’ve been at war over these things for as long as institutionalized fancy has existed. And we were at it long before the fancy came into existence. We’ll probably still be at it once it disappears or becomes something different. The fancy leads to distortions, but distortions are the result of the ego. And it is the ego that must be dealt with before we can start to turn things around– show, sport, or pet.